1. Place the onion slices in a small, heatproof bowl. In a small pan, bring the vinegar, sugar and salt to a simmer, then pour over the onion. Leave to cool, stirring occasionally. 2. Cook the potatoes in a pan of boiling water for 12 minutes until nearly tender. Add the edamame beans and peas to the pan and simmer for a further 2-3 minutes until tender. Drain and cool. 3. Tip the vegetables into a large mixing bowl and add the buttermilk. Discard the dill stalks, chop the fronds and add to the bowl, gently mix and season to taste. 4. 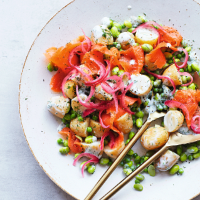 Spoon the salad onto a serving platter and scatter with the smoked trout. Drain the onions (discard the liquid) and scatter on top. This recipe was first published in Tue Jul 10 10:43:00 BST 2018.